Come improve your photography and be inspired by the island of Cuba with accomplished photographer Julia Cumes The allure of Cuba beckons with old world architecture, timeless vistas, smiling faces and a very colorful history. We will travel from Havana to Zapata National Park to the winding streets of Trinidad. There will be rare opportunities to shoot behind the scenes in dance studios and immerse yourself in local life while having in-the-field instruction with Julia Cumes. We stay at small, family run Casas Particulares, with excellent comfort, service and style. Click here to view itinerary. We will eat at privately run restaurants through out the trip. Learn more here. Receive private photography instruction from Julia Cumes focusing on technique, composition, lighting and new suggestions on how to get the best images. Explore the culture of Havana through opportunities to photograph people, dance, architecture and art. Discover the incredibly colorful and photogenic town of Trinidad; a UNESCO world heritage site! In the morning we will have a photo class with a local school making sun prints! There is time to relax on the beach in the afternoon and shoot during the golden light of the beautiful little town. Trinidad is incredibly photogenic and colorful and is also a UNESCO heritage site. We will arrive in the afternoon just in time to explore the streets, stores, artisans, markets, and locals with Julia. Today will be spent wrapping up the photographic journey of Cuba. You may also choose to head out on a hike, explore some waterfalls or head to another beach. Check out of accommodations and depart for Santa Clara. Head to airport for 1pm flights. After airport pickup and settling into our Casa Particulares, we will meet for introductory dinner. After breakfast we will have an initial photo presentation and slideshow by workshop leader, Julia Cumes. Later, we will take a tour of the city in classic 1950’s vehicles of the main Havana historical sites. 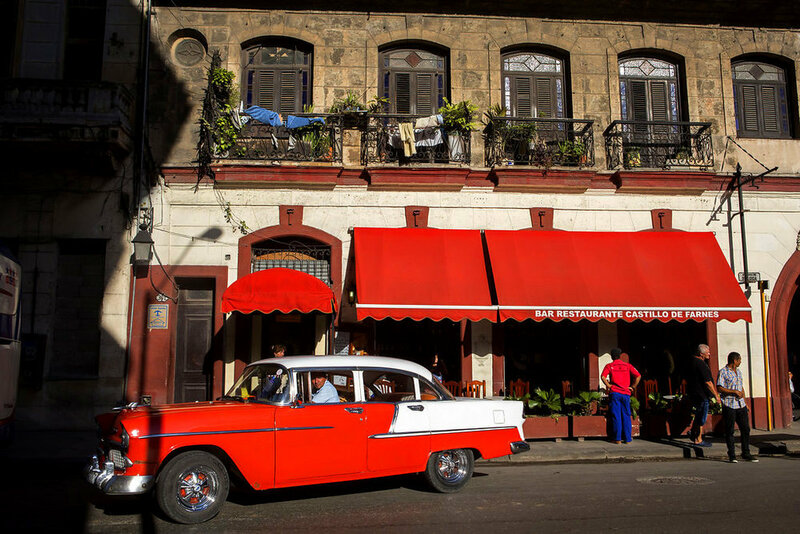 We will be up early catching the best light to photograph Old Havana on foot. After breakfast we depart to photograph 2 dance companies at their rehearsal. In the late afternoon we head to a salsa class! Dinner will be inside Fabrica de Arte. An hour and a half from Havana we will enter Zapata National Park. In the afternoon there will be opportunity for swimming and snorkeling in the crystal clear Caribbean waters. Gallery of images from our last tour! MARCH 6-13, 2020double & single rooms w/ shared bath.